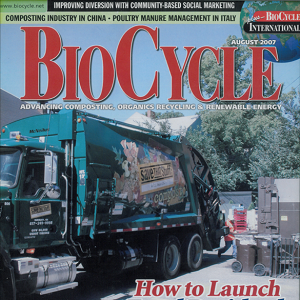 Published since 1960, BioCycle is the go-to magazine and website on composting, organics recycling, anaerobic digestion and renewable energy. Each monthly issue of BioCycle shows you how to process organic residuals such as yard trimmings, food waste, woody materials, biosolids, manure, high strength organic wastes, municipal solid waste (MSW), and other source separated feedstocks into value-added products. Products that include: Compost and engineered soils that renew agricultural and urban soils without the need of chemically-derived fertilizers. Biogas-derived electricity and vehicle fuels that replace fossil fuels and reduce dependence on imported energy. And green industries, enterprises and jobs that build sustainable communities. BioCycle is the Organics Recycling Authority.